I maintain a separate exhibition space where I show examples of work which I feel has acquired a special quality in the making and firing process. Fortunately, I am unable to explain what it is that makes these rare pots happen. Why fortunately? Because I would rather have these pots come into being from "behind my back" - in other words, to be unaware of an intention to make something special. I trust in instinctive behavior in the studio; it is an essential ingredient in the making of my work. Here are these "gifts" from the kiln on which I want to reflect. I place them in the Upper Gallery for viewing, and go there from time to time to look at them and be taken by surprise as I see what has happened in the work. Not to be able to experience these "gifts" and the element of surprise that accompanies them would be a matter of great concern for me. 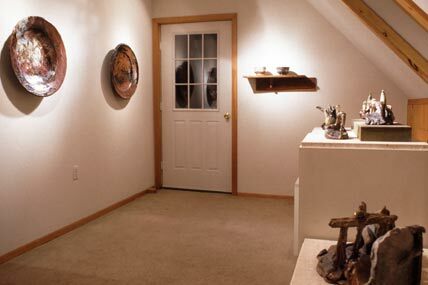 I price the pieces in the Upper Gallery at a higher level than equivalently sized pieces in the studio's showroom. This reflects my desire to honor and respect their uniqueness and the way in which they have come into being. Specific prices and images can be provided on request.